Now, this picture is bad enough, until you realize that Valley Metro completed a huge extension of the rail line in 2016. In 2016 the line length was increased by 31% and the cumulative capital investment increased by 36%. 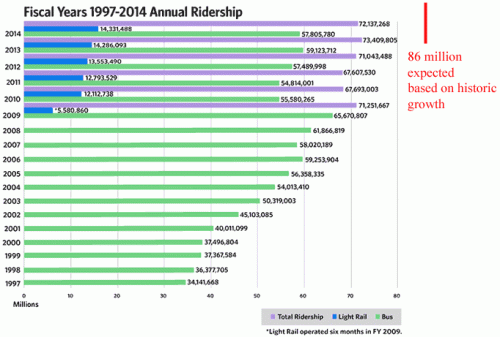 With, as you can see, essentially zero effect on rail ridership in red. The only small highlight was that after falling for years, bus ridership actually perked up a few percent. As you may remember from earlier posts, bus ridership could be expected to fall due to cannibalization from light rail, but in fact it tends to fall even faster than rail ridership rises, causing total ridership to fall. The reason is that light rail costs at least an order of magnitude more (including amortized capex) per passenger mile than busses, and so light rail tends to starve the bus system of funds. Every light rail system implementation has been met with the need to slash bus service to pay for the huge light rail costs. So despite enormous operating subsidies and more than $2 billion in cumulative capex, rail ridership has been flat and total transit ridership has fallen. I will get back to the annotation in a moment. 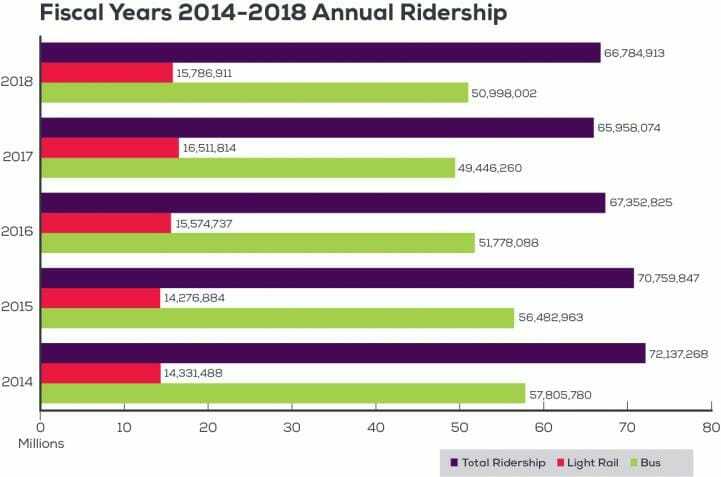 But notice that despite all the cost and disruption and higher taxes from the light rail system, total ridership this year of 66.8 million is less than any year since light rail was opened and baredly 8% higher than it was before light rail opened 10 years ago in 2008. Just organic city growth and recovery of the economy since 2008 should have driven faster growth than this. 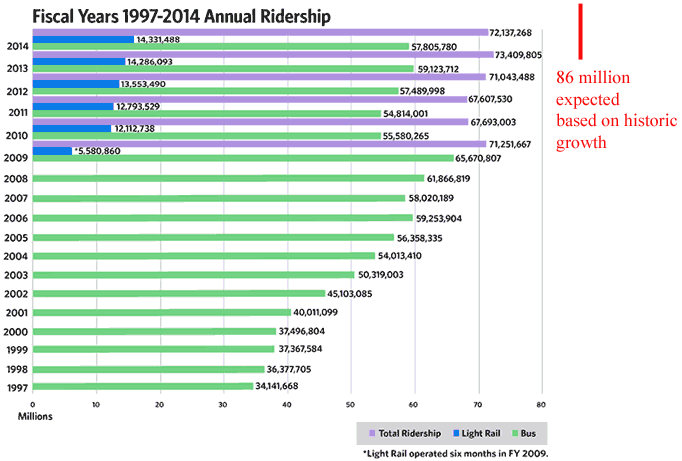 In fact, in the 10 years before light rail was opened, Phoenix transit ridership grew 70%. 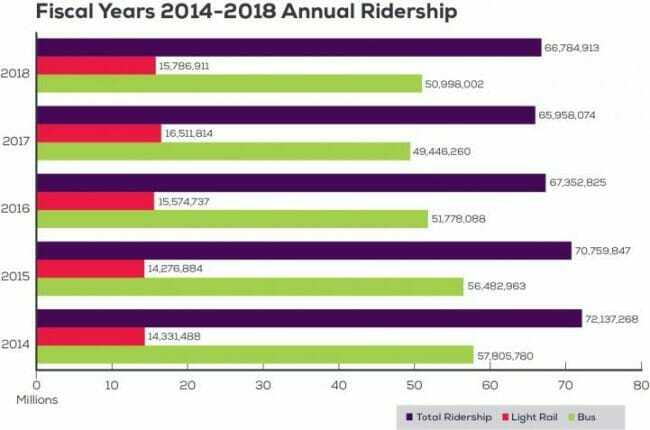 If that organic growth rate in bus service had been allowed to continue without the backbreaking costs and limited capacity of light rail being added to the mix, we should have expected 105 million riders this past year, not 66.8 million. The hefty sales tax that funds Phoenix light rail deficits is about to expire, and as is usual, politicians not only don't want it to expire but they want to double it so they can build more over-priced rail lines. One of the reasons that stuff like this is so hard to fight is a phenomenon called "concentrated benefits but dispersed costs." This means that, particularly for certain crony handouts, the benefits accrue to just a few actors who, due to the size of these giveaways, have a lot of financial incentive to promote and defend them. The costs, on the other hand, are dispersed such that the final bill might only be a few dollars per taxpayer, such that no individual has much incentive to really pay up to support the fight. A great example of this is sugar tariffs. These raise the price of sugar (as well as reducing our choices and effectively promoting imperfect substitutes like HFCS) so we as consumers should all fight them. But the higher cost of sugar might only cost us, say, $20 each a year individually. Are you really going to donate $100 in a political cause to save $20? On the other side, these tariffs create millions and millions of dollars in profit for a few sugar producers, such that they have a lot of money and incentive to spend big on lobbying to keep the tariffs in place. Construction companies, engineering firms and transit service providers are the biggest early supporters of the Proposition 104 campaign to expand Phoenix transportation, while the group fighting the proposed tax increase still seeks major funding. The MovePHX campaign, supporting the bus, light rail and street improvement plan going before city voters in August, raised $382,900 from March through the end of May, according to finance reports filed Monday. More than half of the contributions to the MovePHX campaign during the reporting period came from engineering, design and construction firms, including many that were hired for design and consultation on the Valley's first stretch of light rail. The largest single donation came from We Build Arizona, a group of engineering, contracting and transit organizations that donated $125,000 to the campaign. TransDev and Alternate Concepts, Inc., which hold bus and light rail service contracts, contributed more than $35,000 combined. A combined $30,000 came from police, firefighter and food and commercial worker union political action committees. $382,900 to $417. That is why cronyism is so prevalent. I know this is just a trivial example, but somehow it seems to be representative for me of a larger class of legislation - yield to the state! In 2009, Colorado legislators passed the Yield to Bus Law to help transit agencies that were finding that the inability of buses to get quickly back into the traffic flow after a stop was hurting their on-time performance. That does seem to be the point - produce citizens that are in the habit of yielding to the state. Because we all know that having the state's bus full of empty seats stay on schedule is far more important than the schedule of all the little people around it. When government schedules don't work, what do they do? Change the schedules? No! Change the behavior of the citizenry so the schedules can be made to work. Nothing wrong with the schedules - its all you folks who are broken. Yesterday I posted on a new bus system Phoenix is implementing but that appears to cost 30x less than the light rail system we just built. I wrote Randal O'Toole of Cato, also known as "the AntiPlanner," to see what he knew about this system. Here is what he was wrote back"
Yes, I've written about it a lot. The best system is in Kansas City, where they didn't feel they had to spend $750,000 to make a $300,000 bus look futuristic. The only thing good about it is that it didn't waste as much money as light rail. But that's like saying you'd rather be stabbed in the heart with a three-inch knife than a six-inch one. In 2005, Kansas City did a wonderful thing: It started a bus-rapid transit system the way bus-rapid transit ought to be done. The transit agency didn't spend hundreds of millions of dollars building exclusive bus lanes. It didn't buy million-dollar buses just to have a semi-futuristic look. Instead, it simply began running buses on existing streets on rail schedules. That is, the buses stop only once per mile and the operate three to four times every hour from 4:20 am to 11:20 pm. The greater frequencies and faster buses increased ridership by 25 to 30 percent (see page 11), and most of these new riders were new to transit. The city built inexpensive but easily identifiable transit stops for the route. The buses were regular buses but were "branded," that is, painted in an easily recognizable style. In short, Kansas City achieved the kind of ridership increases that light rail would achieve for a tiny fraction of the cost. In other words, the basic idea makes great sense, but spending a million bucks a bus (as Phoenix plans) just to make the bus look like a train is crazy. All true, but I might be willing to give in on the more expensive busses if thats what it takes to kill this crazy infatuation with steel rails. In the Phoenix Mesa Link example, they are probably spending $4.5 million too much for the train-like busses, but if that gives public officials the ability to walk past the light rail buffet and save the $800 million extra rail would have cost, I might consider that a good investment.